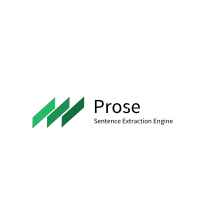 Prose Sentence Extraction Engine identifies the individual sentences in natural language text. Prose Sentence Extraction Engine identifies the individual sentences in natural language text. When input text is received via its API, Prose extracts the sentences contained in the text. Prose requires minimal resources and is stateless and scalable. Prose supports many languages and for an up to date list of languages please see the Prose home page. Extracts sentences from natural language text. REST API for sentence extraction. Lightweight and requires minimal resources.